SOUTHINGTON - Kyle Messenger, Billy Carr and Angelo Plantamuro know they have some big roles to fill. At the same time, they aren’t lacking in confidence. “I think we bring that juice to the defense,” Plantamuro said. The Southington football team, particularly the defense, will need them to. 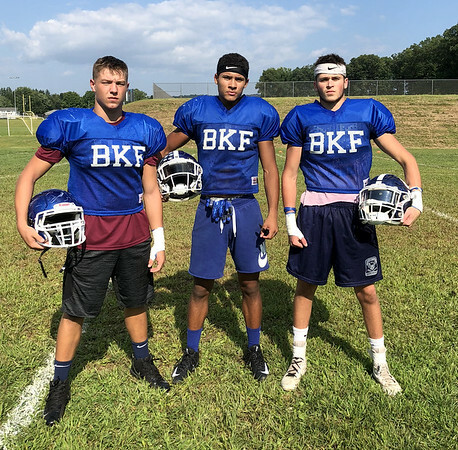 With the Blue Knights in the midst of a defensive overhaul, having to replace eight of 11 starters, the trio have become the faces of the unit, taking over a linebacking corps that featured the likes of Ryan Montalvo, Ian Hall and Joe Koczera in 2017. Expectations for Messenger, Carr and Plantamuro are high. Southington allowed just 133 points (13.3 per game) last season with Montalvo, Hall and Koczera as some key reasons why. The three combined for 1/3 of the Knights’ total tackles (218 of 659) and 16 of 39 sacks. Both Messenger and Carr were able to get some varsity experience last season. Messenger appeared in nine games as a junior, recording 23 tackles. As a sophomore, Carr finished with 11. Plantamuro, now a junior, was the only one not to appear. The new group isn’t shying away from those expectations either. Numbers aside, their speed and aggression have been highlights during camp and the work they’ve done this offseason has people confident of the transition. Still, all three know it will be the results on the field that matter. They also believe they have the skill sets to produce those results with Plantamuro being designated as the sideline-to-sideline linebacker with Messenger and Carr capable of plugging up the middle when needed. After all, they said, every good offense needs a good defense. Opponents will certainly be looking to test that, but Messenger, Carr and Plantamuro are confident they can deliver. Posted in New Britain Herald, Southington on Wednesday, 5 September 2018 21:15. Updated: Wednesday, 5 September 2018 21:17.